Forget Christmas, New Years and Easter - it’s almost time for the most wonderful week of the year, Brewsvegas. The holy grail for all things brewed and beery, we can’t wait to get out our tasting paddles and get drinkin’ those ponies! We’ve rounded up our top picks so you can check out what all the brewhaha is about. Get ready to get on the Fritz! Four small breweries will go into battle with four very big beers, fighting for your love, and bragging rights. The one rule? Beers must be a minimum of 10% ABV. Watch as Croft Brewing, Brisbane Brewing Co., White Lies Brewing and Brewdito battle it out for glory, and try some of the tipples along the way. Just consider taking Friday off, these bad boys are gonna pack a punch! 15TH March 6pm-late. Free event. 7 breweries. 7 states. 1 winner. The ultimate showdown. Japanese Game Show Night at Zero Fox is set to push challengers to the limits with sumo wrestling mania, human shuffleboard, hot wing eating competitions and so much more. Register your team of 2 to join a brewer’s team, and bring their state to victory. 12TH March from 5-10pm. Free event! Who hasn’t dreamed of crackin’ open a cold one with Bill *expletive*Murray? Now’s your chance movie buffs. Join Limelight Cinemas and All Inn Brewing for an evening of brews and bill. Sit back, relax and enjoy a screening of Groundhog Day, three beers and a selection of finger food from The Lounge. Sounds finger lickin’ good to us! 14th March from 6.30pm. Buy tickets here! CALLING ALL FANTASTY NERDS! Ready your costume and prepare to enter the fray, it’s time to delve into the fantasy realms of Netherworld for ‘We Quest for XP! ?’ Our favourite gamers paradise will transform into the ultimate fantasy tavern for prospective dungeon explorers. Prepare for a series of quests including treasure hunts, riddles and gaming challenges to earn XP to claim rewards. And of course, there’s going to be BEER. 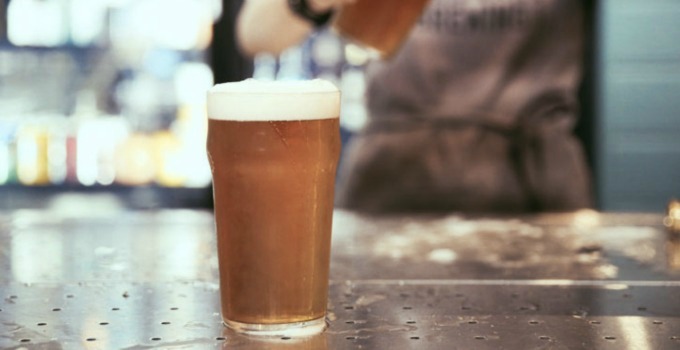 Netherworld is teaming up with Mornington Peninsula to create the limited edition Tavern Ale, perfect for the weary traveller. 12th March 6.30pm-10pm. Buy tickets here. THE BATTLE OF QLD IS HERE! Will the Sunshine Coast slay, or will the City conquer? Watch Brouhaha take on Slipstream in the ultimate bid for beer brewing supremacy – handball. Show your colours by joining either of the crews with the loser putting on a free keg of their finest for all to enjoy after. 11TH March 12-10pm. Free event. We’re still fighting over who owns Russell crow and pavlova, but we can agree on one thing, our neighbours across the pond can brew a damn good beer. Gorge yourself on Kiwi-themed lamb pizza (something, something sheep joke), washed down with Kiwi brews from 8 Wired and Garage Project. Groove out to Crowded House, Fat Freddy’s and Flight of the Concords before settling in for a screening of a cult Kiwi classic at dusk. Churr! 11TH March 3pm-Late. Free Event. Man’s best friend deserves an afternoon out, and the good people of Archer Brewing couldn’t agree more. Pack up your pooch and head to Spring Hill for an afternoon of beers – for you AND your furry friend. Serving up the 100% dog-friendly Woof Ale, as well as their signature brews for us with two legs. With local pup stalls, a hydrobath van to get your pupper looking freshhhhh AND a brand-new Archer Brewing Beer debuting – you’d be barking mad not to sniff this out! 10TH March 1-9pm. Free Event. Think you’ve got what it takes to rub shoulders with the big boys and gals? Consider yourself a bit of an inventive type? Now’s your chance to show what you’re made of and step into the shoes of a brewer for the day. Live the dream of your beer destiny with a behind the scenes brew day, complete with brewers lunch (pizza), quality control (drinking beer) and a whole lotta tips. Whether you’re an aspiring pro-brewer or just a beer geek – you’ll be hopping mad if you miss out. 10th March 10am-2pm. Buy tickets here! Calling all horror fiends! Zombie crawl your way to Kettle and Tin for ‘brain’ burgers and Bloody ‘Head Shot’ Marys. Aether Brewing, Mismatch Brewing and Black hops will be supplying the tinnies to keep you hydrated as you do the monster mash to live music, and take a break from human flesh to get around the Shank Bros manning the smoker. It’s going to be a ghoulish good time. 17th March 9am-2pm. Free event. Move over B-grade, we’re all about that D-grade monster movie madness. Saccharomyces beer café has teamed up with Kaiju Beer & Killer sprocket to bring you monster screenings on a monster screen. Consider yourself a comedian? The Kaiju and Killer crew will be roaming the floor with microphones for you to add your own commentary. Crack a can, grab some popcorn and let the show begin! 16TH March 3pm-Late. Free entry. When in doubt, head west. Start at one end of West End and drink your way to the other, stopping in four of the most hoppening venues this side of the river. Knock back a tasty brew and bite to eat at Bosc, Catchment Brewing Co., Brisbane Brewing Co – before finishing at Archive. 14th March from 6.30pm. Get tickets here! Brewsvegas virgin or seasoned schooner slinger, there’s something for everyone this year. Words by Emma Callaghan – the gourmand who is calling in ‘sick’ for March. - the gourmand who is calling in ‘sick’ for March.